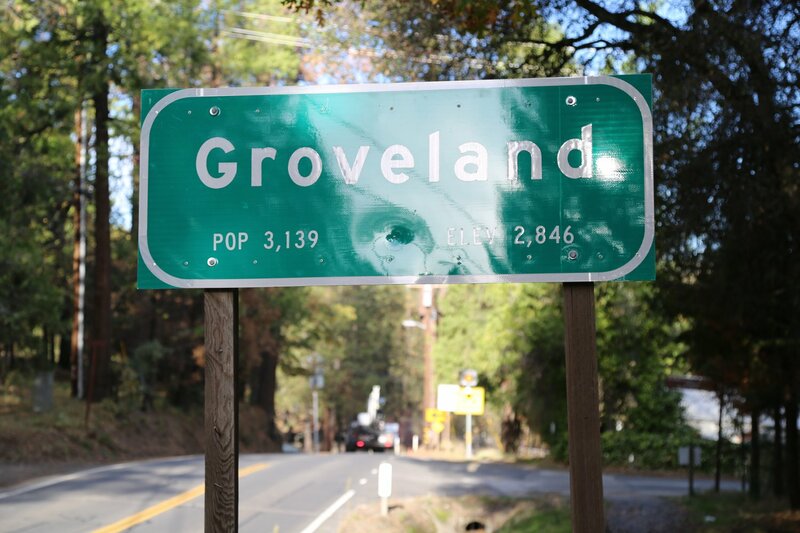 Groveland is a town of about 3,000 people located on Highway 120 about 20 miles from the Yosemite Park entrance. There are several small restaurants, hotels and one hostel in this town. The center of town basically consists of the narrow Main Street with historic buildings located on both sides. 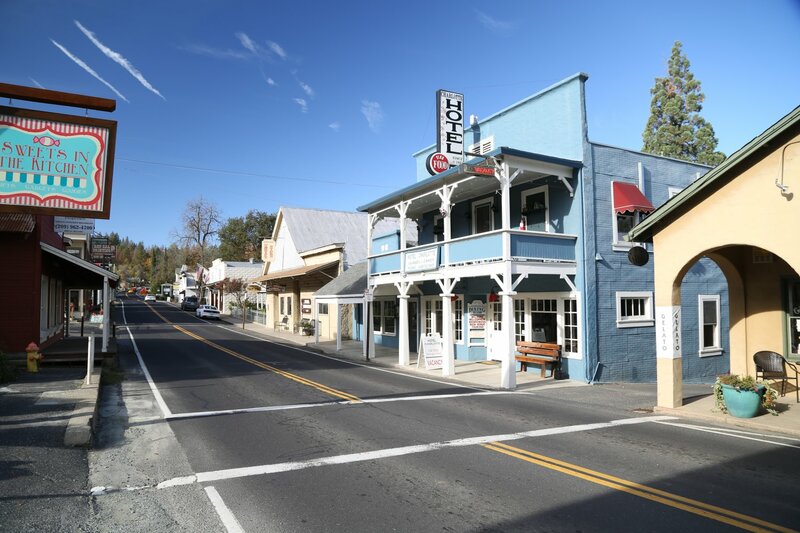 Because of its small size, one can easily park and spend some time strolling the picturesque Main Street. 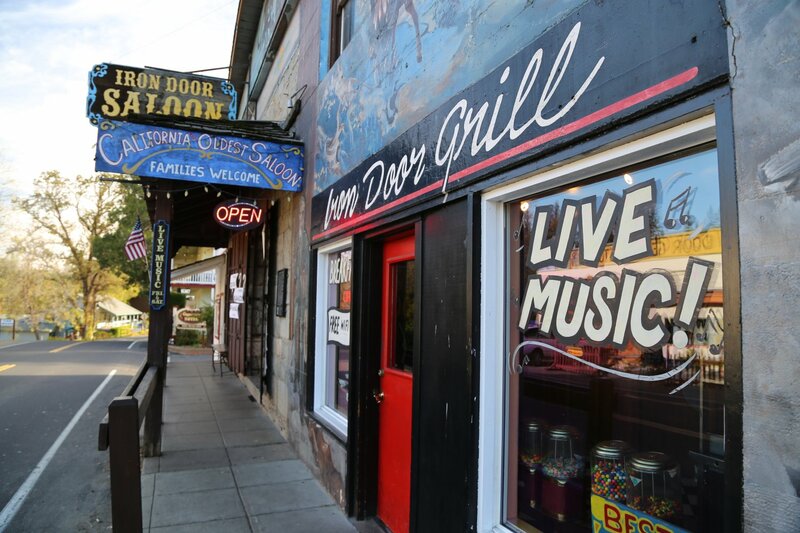 The Iron Door saloon (one of California’s oldest saloons) and several small antique shops and a BP gas station are located here. 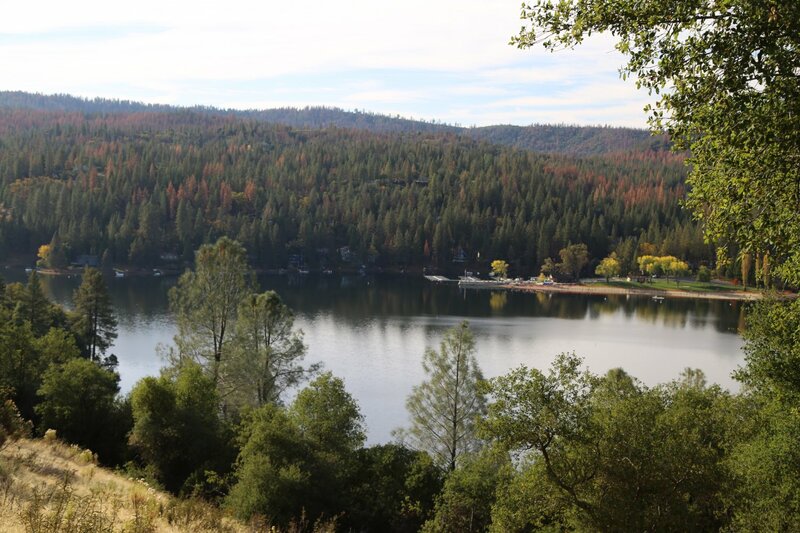 Pine Mountain Lake Country Club is also located within a few miles of downtown Groveland. 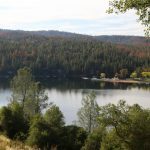 The Pine Mountain LCC is a private gated community with a beautiful small lake and beach serving residents and guests of residents (we were able to enjoy this lake for several summers in a row). However, the restaurant and bar are open to the public. 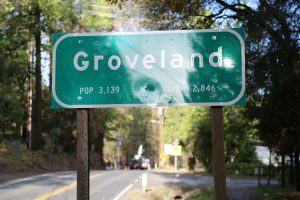 Groveland is located a few miles from the infamous Priest Grade. This grade can be driven either two ways, on the ‘new’ road or on the old road. The old road is *much* shorter then the new road, however it is also much steeper. We have almost burned out our brakes several times in the heat of the summer out racing down the old road – best to put it in gear 1 or gear 2 and take your time. The vegetation in this area burned off several years ago and Cal Trans had problems with mudslides and sliding dirt. Today all the chaparral has grown back and you cannot even tell there was a fire in this area. 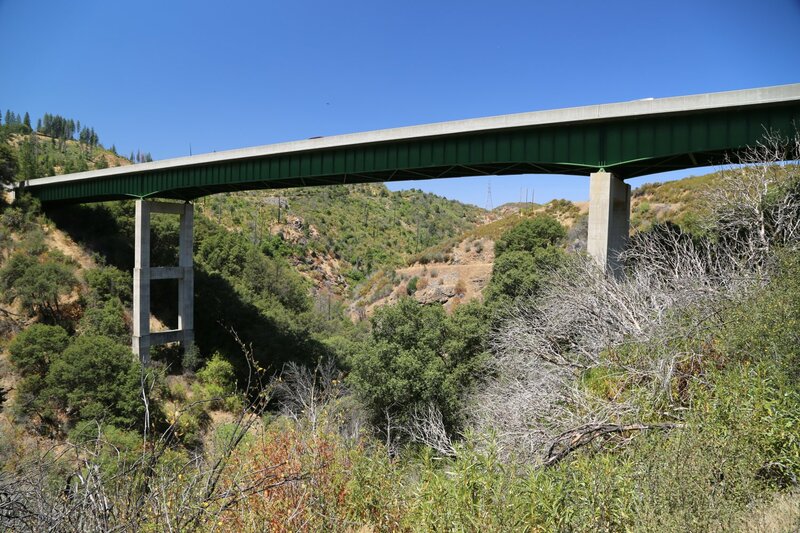 There is a gate at the bottom of the Old Priest Grade Road and CalTrans sometimes will lock this during inclement weather. 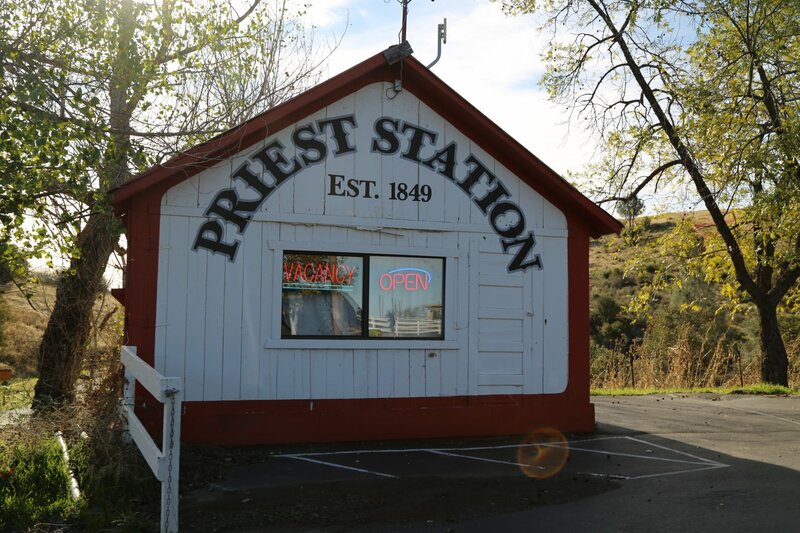 Also take note of Priest Station (established in 1849) perched at the top of Priest Grade. 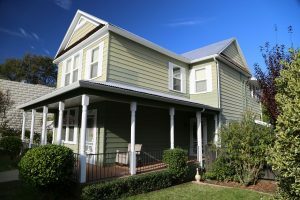 The Priest Station Cafe and Store is located here – and is a great place to enjoy a quiet breakfast. This cafe is run by long time in the area Anker Family – son Conrad is well-known in the mountain climbing world for discovering George Mallory’s body on Mount Everest in 199 and a number of other climbing adventures around the world. He also starred in the epic climbing film Meru (highly recommended). Conrad’s brother works at this cafe. 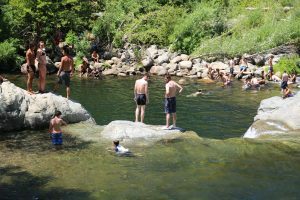 Rainbow Pools is located about 15 miles east of Groveland. 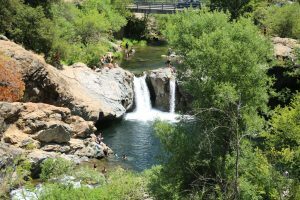 This hard to find, not signed natural attraction is just west of the turn off to Cherry Lake – look for the long bridge on Highway 120 that spans over the Tuolumne River Canyon – the narrow paved one-way road the leads down to the falls is on the south west side of the end of the bridge – just off of the highway. 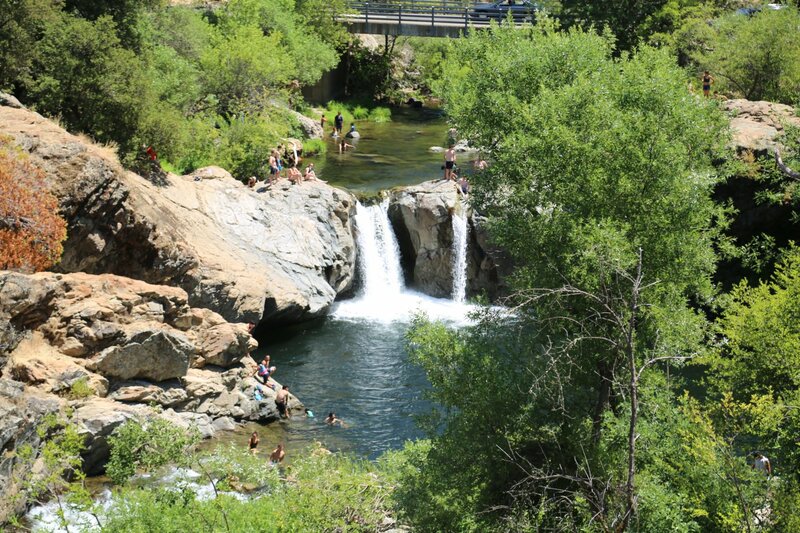 Only a few parking spots are located next to the steps that lead down to the Tuolumne River and Rainbow Falls. 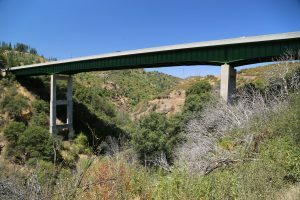 As you continue on the one-way road it will start to climb back out of the canyon – parking is along any extra space next to the side of the road. 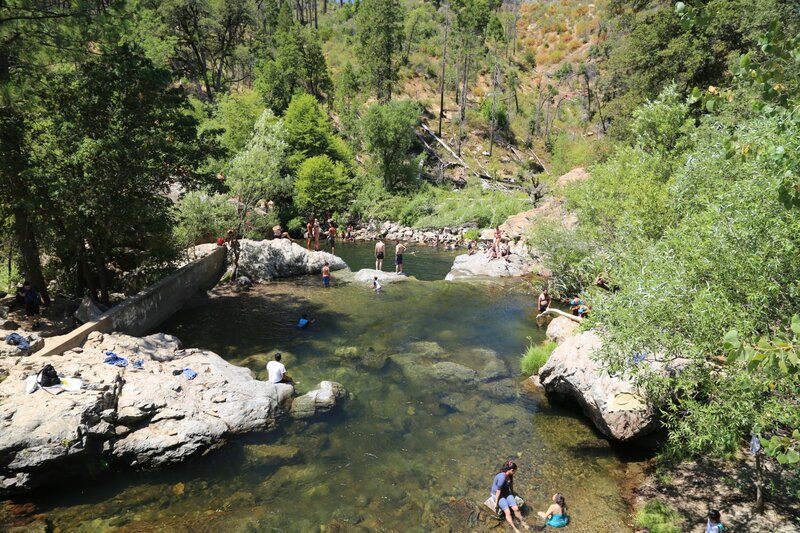 During hot summer weekends, this place is packed to the gills. And at times (usually early to mid afternoon) we have seen absolutely NO parking the entire length of the one way access road. Often popular with teenagers jumping off the edge of the rocks into the pools. 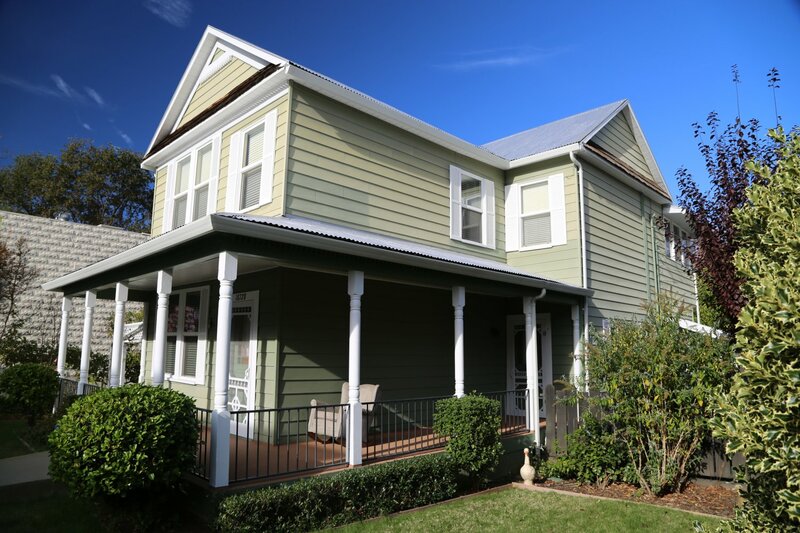 Very popular with families to. 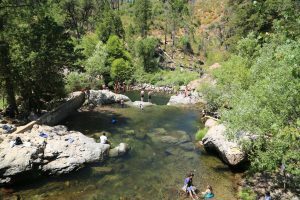 When the river has plenty of water – there are numerous pools one can relax in – many are easily accessible above the actual Rainbow Falls.